Today is the 4th edition of our periodic guest post series called 10 Questions and a Pizza Place. (The 1500′s are pizza fanatics.) We have a list of 17 questions we pose to fellow financial bloggers, and they are free to pick and choose 10 or answer all 17. Let us know if you would like to be featured in a future edition of 10 Questions. Today’s edition features Jen from JenSpends.com. There is a lot I could say about her site (all good, trust me), but her writing speaks for itself. If you do nothing else today, check out the story of how she met her husband. It may just bring a tear or two to your eyes. 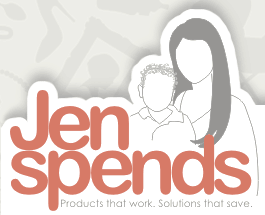 I started my blog, JenSpends.com, in 2009 after I decided to quit my job and become a stay-at-home mom. I write about all aspects of frugal living, including shopping tips, DIY projects and cooking. Since I believe that purchasing quality products is an important aspect of frugality, I also write product reviews from time to time. I try to help people see how much they can do with a limited income. I didn’t have a clue about money when I headed off to college. I am the oldest of five children, and my family was not well off. My dad helped me sign up for credit cards to pay for books and supplies, and he would handle the bills. Well, it took just a few times of him either forgetting or not being able to pay, and I soon had three credit cards at 28% interest. I was pretty disciplined about spending overall, but it was too easy to think “Well, Dad’s already paying $30 per month on the card anyway, so how can this clearance pair of shoes hurt?” It wasn’t until I graduated college and was turned down for my first car loan that I learned how dire my credit history was, and what interest rates really meant. I took the bull by the horns and set up a strategy to pay off all of my credit card debt and pay for a used car within one year. I was engaged and didn’t want to bring that baggage into my marriage! Never again will I leave control of my finances to someone else. I would immediately pay off the mortgage, and also travel with my family to England to visit the in-laws. I would probably put the rest into savings for retirement to get that out of the way, then use the money we would have been spending on the mortgage and retirement to fund house projects and other expenses that might come up. I bought a used 2005 Chrysler Pacifica in 2008 for a “mommy car”. The gas mileage isn’t great, but I usually only drive it on short trips locally. It has been an excellent car. It’s like a tank in the snow, and we have not had to make any expensive repairs yet (we shall ignore the bumper cover replacement as a result of me backing into my husband’s car. Oops!). I am inspired by people who have made mistakes, but have put in the hard work to turn their lives completely around. It’s nice to know that it’s never too late, and just because you screw up doesn’t mean you have to live with it the rest of your life. In early 2012 my husband and I decided to pay off the rest of our debt (except our mortgage) within a year. We used Dave Ramsey’s snowball method, and reached our goal in February 2013. My student loans were paid off about 2 years ahead of schedule, and my car was paid off a year early. It still feels like we never have any extra money, but that’s because we’re directing it into savings now. I am also proud of our decision to pay cash for all the improvements we made to our first home. Even though the housing market was awful, we still managed to make a profit when we sold over the summer, and we’ve made improvements to our new house with cash from that sale. I love to travel just about anywhere, but my idea of a vacation is some place sunny and warm. I loved California, where we went for our honeymoon, and the southeast is nice, too. My extended family likes to meet up at Pawley’s Island, South Carolina every few years where we rent a huge beach house. It’s a beautiful place, and we can drive down from New York so we save a lot of money. You’re not saving money if you’re wasting it! I see a lot of “frugal bloggers” promote bargains on junk. If you don’t really need it, or it won’t last a while, you’re not saving money no matter how inexpensive it is. Over the years I’ve learned that every little bit counts, and I’ve gotten better at saying “no” to things I don’t really need. Besides, I don’t want the clutter in my house. We have so many great ones around here that it’s difficult to choose! One popular local institution is Pepi’s. It’s been around for decades and is legendary for its kitschy decorating and game room full of ancient arcade games. They have a special way of aging their pizza dough so the crust has a distinctive flavor. My biggest goal is to achieve financial security (and wealth), so that my family can do what we want and help others without worrying where the money will come from. Another goal is to write a book and get published. I have no idea what I want to write about, but it’s a major accomplishment that I would like to experience someday. It’s tough to choose just one, but Napoleon Dynamite ranks up there. I also love Airplane! I have an odd sense of humor. My husband and I like to laugh at disaster movies. I devised a rating system using Dante’s Peak as the standard by which all other cheesy movies are judged. Save as much as you can, don’t incur new debt, and pay off any debt you already have as quickly as you can. I’ve always been a PC person, but I won an iPad a couple years ago and that has made me a lot more interested in Apple products. I think I’d like a MacBook someday. I rely heavily on Mint.com for keeping tabs on my accounts and budget. I also enjoy reading DaveRamsey.com and GetRichSlowly.org. I’m still kind of new to personal finance, so I’m sure there are other great resources that I don’t know about yet. Nothing really stands out, to be honest. I’m wary of advice in general, and tend to look more at how a person lives than what they say. I recently came across a great quote attributed to Albert Einstein that kind of sums up my approach to life: “I have no special talents. I am only passionately curious.” No one ever told me to be curious, but I think “Be passionately curious.” is an excellent piece of advice for anyone. No one should ever stop learning. I love animals in general, but I am definitely a dog person. I love their goofiness, level of interaction and the ability to take them for walks. We adopted a Schnoodle puppy from a rescue last year, and although he tests my patience like nothing else can, I’m glad we added him to our family. Prosper or Lending Club? Please explain. I had never heard of either of these before reading about Lending Club on your blog recently. I think it’s a really intriguing idea, and I would like to try Lending Club once I have some extra money to invest. Prosper sounds good, too. I have difficulty wrapping my head around the stock market, but peer to peer lending seems like something that I can really grasp. My son is 4 1/2, so we haven’t delved too deeply into this yet, but there are some basics he has learned from an early age. If he’s whining for a new toy at the store, I ask him how much money he brought with him—mommy isn’t the bank. He also sees me use a shopping list at the grocery store, and he knows that we don’t buy things that aren’t on the list. He actually helps keep me on track sometimes! He is learning to save money with a vintage cash-register style bank that a neighbor gifted him. It can’t open until he saves $10. So many people live beyond their means. I know people who seem perpetually stressed about paying for emergencies or even just basic needs, but they bristle at the suggestion that they ditch their smartphone plans or their hundreds of cable channels to ease up their budgets. I previously said that I love animals, and dogs in particular, but it astounds me how much the pooch pampering industry has grown in recent years. Dog strollers? Really? I have a degree in architecture, but wound up doing graphic design for several PGA tournaments. I drew spectator course maps, created signage, and produced 3-D renderings of hospitality tents. It was stressful meeting tight deadlines while doing things I had never done before, but it was the most fun I have ever had in my career, and I got to see some of my work on national TV! Best of all, I was able to continue doing that type of work at home after I left my job. Thank you Jen! Go visit her at JenSpends.com. I love what you’ve done with your son! That’s super important at an early age. And what the heck is wrong with folks? Dog strollers now exist? And, yep, I’ve seen some spoiled little dogs being being pushed around on sidewalks in my city. It’s crazy! I hadn’t heard of Jen’s site before, so thanks for sharing. Sounds like we could learn alot from her! Thank you Laurie! I’ve been exploring your site a bit, too. So nice finding like-minded people. Inspiring story about your college financial experience. Congrats for staying on track.